Fashionable leather bracelet for men and women, 100% Brand new and good quality. Total 20 kinds of styles for you to choose, so you can select the one you like. A perfect ornament that can make you become a more eye-catching person in the crowd. 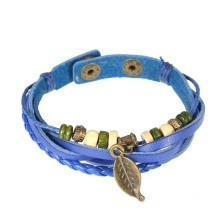 Fashionable leather bracelet, 100% Brand new and good quality. Easy to wear, adjustable width design, fit for most people. A perfect ornament to make you attractive and charming. Quite a good gift for your lover, friends, families, etc. Multiple styles of bracelets for you to choose, so you can select the one you like. 1. There are 20 different styles of bracelets for you to choose, and different styles have different features, please check the picture carefully before you ordering. 2. Due to the different monitors and light effects, the actual color of the product maybe a slightly different from the picture color, thank you for your understanding.